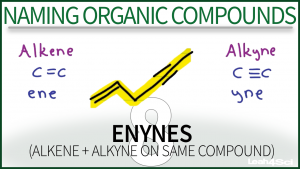 This is Video 8 in the Naming Organic Compounds Video Series. Click HERE for the entire series. I mean… which is correct? OOPS! I think i have solved it (if the answer is second one) …. Sorry for trouble! i love your videos but i was confused with the last example of having double bond, triple bond, and substituent …. why did you give methyl priority ?? shouldn’t we give it to the double bond ?? At which point in the video are you asking about? There are some errors in my videos (I am human after all) so I want to double-check before answering. Why is it that Ene gets priority when they can be numbered the same? Is it because e comes before y in the alphabet?